Kaneohe, HI -- Bluegrass in the Ko'olaus, a weekend event that features homemade bluegrass and traditional music in a spectacular setting, will take place at Kaneohe's Ho'omaluhia Botanical Garden from Friday, April 13 through Monday, April 15. The event, hosted by Bluegrass Hawaii Traditional & Bluegrass Music Society, a 501(c)(3) non-profit, is FREE, though donations are welcome. 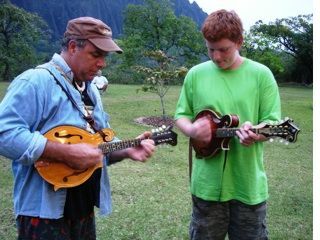 Bluegrass in the Ko'olaus, a weekend event that features homemade bluegrass and traditional music in a spectacular setting, will take place at Kaneohe's Ho'omaluhia Botanical Garden from Friday, September 9 through Sunday, September 11. The event, hosted by Bluegrass Hawai'i Traditional & Bluegrass Music Society, a 501(c)(3) non-profit, is free though donations are welcome.